This Thursday, I finally saw “them” – or perhaps I should say, “her.” I was bicycling through the science section of campus and there they were – banners put up by SPEAK, the anti-vivisection group generally thought to be behind actions like the burning-down of University College’s boathouse. I have to admit, I was a little underwhelmed. 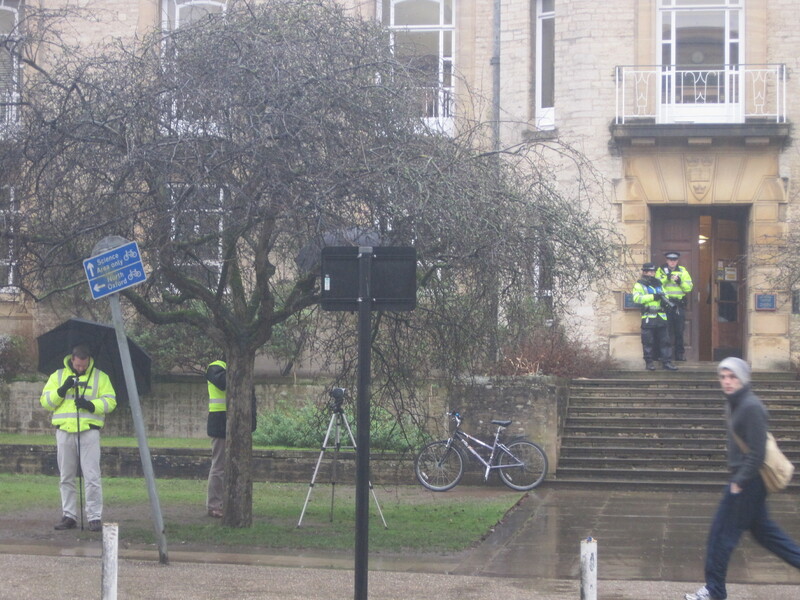 Next to large banners condemning Oxford and mourning the death of a monkey named Felix, there were a few late-middle aged women, standing silently in the rain, holding signs. There were at least twice as many police there, I can only assume preventing them from breaking into those violent, dangerous actions that we all know they engage in after dark. Sometime during the Bush Administration, animal rights protesters like these were labeled the United States’ “number one” domestic terror threat. The Obama administration has continued the trend, pandering to the right wing by promising to vigorously prosecute animal rights “terrorists,” like four people in Austin who had the audacity to chalk a sidewalk. The United Kingdom, too, has jumped on the bandwagon: after Britain declared it had become the “Afghanistan of Animal Rights terrorism,” the government began a major campaign of infiltrating and monitoring activist groups. 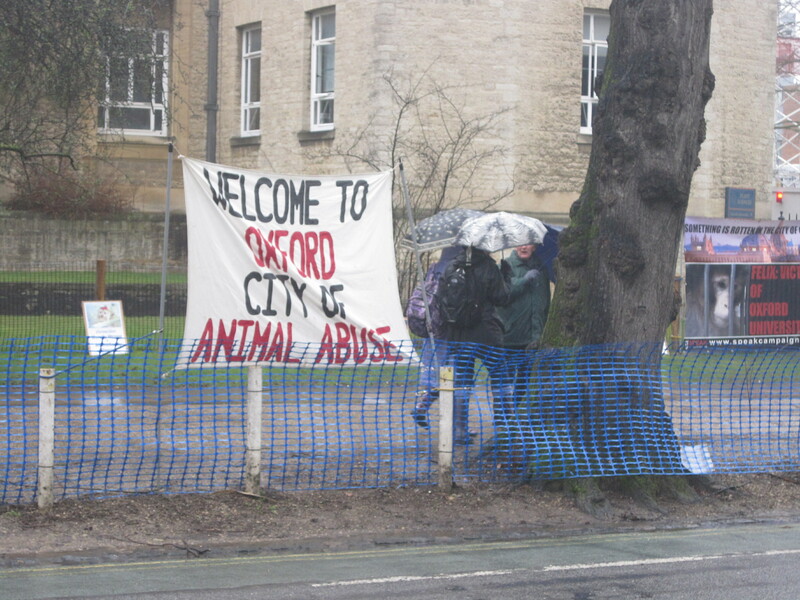 All this policing effort seems to suggest that animal rights radicals – like those at Oxford – are a real threat. There’s just one problem with this narrative, though: animal activists have never managed to kill anyone (although a few animal activists have been killed.) Yes, pro-AR radicals have caused some (relatively minimal) property damage, and even a few injuries. The principles of the Animal Liberation Front – the group most often associated with animal rights terrorism – are telling: point four of five is “To take all necessary precautions against harming any animal, human and non-human.” As far as I can tell, they’ve done a reasonably good job of adhering to these principles: in 1500 animal rights actions monitored by the British police, only seven resulted in injuries. Whatever your views on property destruction, I am struck by what a distant departure these actions are from what I classically envision “terrorism” to be: the use of violence against non-combatant persons to intimidate a civilian population for political reasons. It’s impossible for me not to draw a comparison to the recent “incident” in Austin, Texas, where an anti-government crazy named Joe Stack flew a plane into an Internal Revenue Service building, killing himself and one employee while injuring a dozen others. A few friends have forwarded me his manifesto, and expressed to me how much ‘sense’ it seems to make. Indeed, while the Tea Party is celebrating Stack as an American hero, even some allies on the left seem to be convinced that Stack must not be all that bad of a guy because he denounced Congress’ failure to pass health care reform. I find this completely infuriating. Make no mistake – the only difference between Joe Stack and Timothy McVeigh, the Oklahoma City bomber who killed 168 at a similar federal building, is that Stack didn’t succeed. And yet, the consensus seems to be that what Stack did wasn’t terrorism. I am left wondering: what does it say when breaking into a lab to save rabbits is terrorism, but flying a plane in a building in order to kill people trying to make an living (albeit off of a system you oppose) is not? When I wake up to a New York Times front page reporting murdered abortion doctors, massacred Afghani civilians, a mass movement calling for revolutionary violence against the Obama administration, and a political class that seems concerned about none of these things, I find myself thinking: what the world could use is a few more little old ladies, standing in the pouring rain, choosing to make a statement while most would rather be inside making money or caring for their own affairs, simply because they are worried about some mice in a lab. If “they” are terrorists, then I can only hope someday I will be labeled a terrorist too. The face of terrorism at Oxford. I think you are doing some real thinking. (I’m a professor. We talk that way.) You’re right. Flying planes into buildings because of your political beliefs is terrorism. But you do understand that the occasional case of arson can have disastrous results. I have no problem with animal rights activists demonstrating and any of the other peaceful means people use to get their ideas across. I am willing to also consider civil disobedience as a legitimate means of protest. But there needs to be considerable care as where they draw the line as to what is legitimate action. People can be hurt as a result of property damage, in particular, arson. You have put your finger on the hypocrisy that is endemic in the much of the media. You are going to find a bunch more of this nonsense and not just occasionally with the people you side with. But whenever you shout that the king is naked, you change the discussion a little and we need more of that. “People can be hurt as a result of property damage, in particular arson”. Yes indeed – ask the Iraquis and Afghan civilians about the arson committed by the West in their countries. Now WHO exactly is the terrorist, Professor? As one of those “little old ladies” (I’m 73) who stands outside the Oxford animal lab each week, I would like to thank the author of the article. If what I do is terrorism, then I am proud to be labelled a terrorist. It is certainly an upside-down world when we who wish to save lives – the lives of billions of animals a year – are the terrorists, while those who take these innocent lives are rewarded for their “work”. George Orwell must be giggling in his grave! All I do is hold up placards and hand out leaflets. However, the real heroes in the animal rights movement are those who break into the hell-holes and rescue the victims of terrible abuse. You who read this may not know what is done in your name. Helpless, innocent animals are put into restraints and subjected to mutilation, burning, scalding, blinding, poisoning and whatever other torture you can think of. The majority of them are unanaesthetised. They scream from fear and pain, and when they struggle, trying to escape, the technicians shout at them, slap them and even throw them against the wall. In fact, there is no escape for them. At the end of their vicious treatment they are killed. If we add together the 50 billion animals who suffer and die in the farming industry and the millions who suffer and die in laboratories, the figure is horrendous. That is why I stand in the rain; that is why I applaud those who break into buildings to rescue a few of our beautiful and precious fellow-creatures. Those who oppose us are heartless, cold-blooded, inhumane monsters. Most of the Oxford students walk past us with their noses in the air; a few mutter abuse. I refuse to believe, however, that there are not some who secretly support us and are too afraid to “come out”. If any of you are reading this, I would ask you not to be afraid. Come and speak to us and you will see that we are the compassionate ones while your lecturers are the uncaring monsters who support the Oxford vivisectors in their pointless cruelty. Mahatma Gandhi said, “To mutilate a living being is man’s blackest of black crimes.” He was no terrorist, but rather a good and compassionate human being. The day we all try to emulate him will be the day humankind switches from evil to good. I would like to support what Naomi says – we do not harass, intimidate or insult anybody. 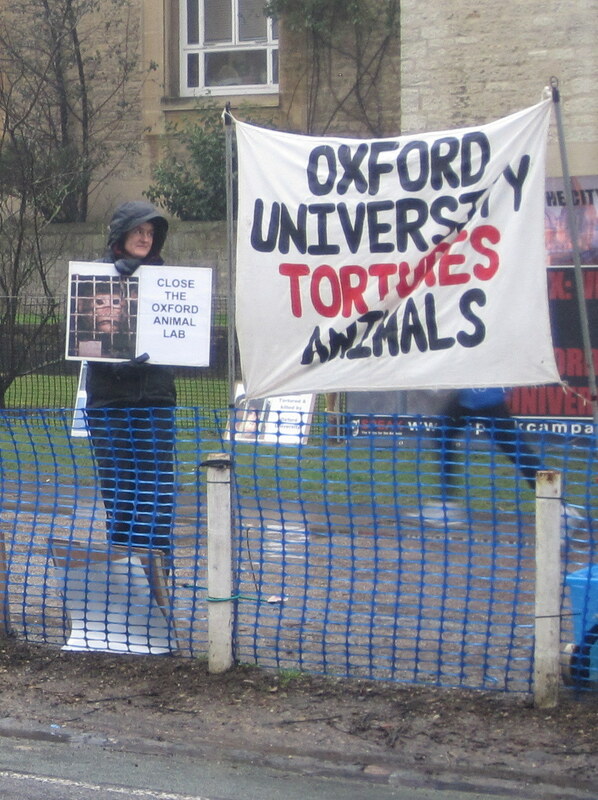 We stand with our banners letting people know what is going on inside the animal testing laboratory in order to give people/students/tourists the information which Oxford University wishes to suppress. No major change in Society has been achieved without years of protest and civil disobedience (both of which are supported by Professor Pilant). Civil disobedience to most sectors of Society would consist of blockades (such as seen with the EDO campaign in Sussex and also the fuel blockades of a couple of years ago); however if an animal righs protestor blockades a vivisection laboratory or other establishment connected with the vivisection industry, then this is a crime punishable by imprisonment.